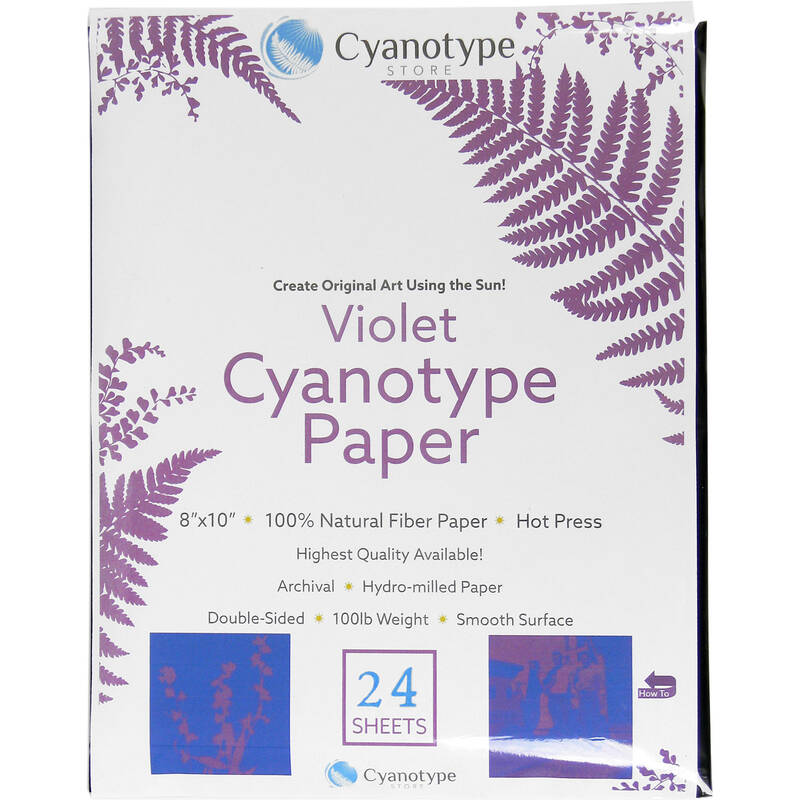 A fun and simple way to make prints of objects or negatives, this Cyanotype Paper from the Cyanotype Store is a 24-sheet pack of 8 x 10" purple paper. This paper is pre-treated for cyanotype printing, which allows you to simply arrange your objects or film on top of the paper, expose using sunlight, and process by rinsing in water. The cyanotype process is archival and the 100 lb hot press fiber-based paper is durable, making it well-suited for repeated rinsing if toning the prints to achieve a different color effect. Cyanotype Paper (8 x 10", Purple Lilac, 24 Sheets) is rated 4.7 out of 5 by 6. Rated 5 out of 5 by DogMan from Was a hit at fine arts Camp! This paper was used to teach two groups of students how film and sensors work at fine arts camps this summer. Not only were the students amazed, we saw some creative cyanotype photograms. Ww also made a set of 12 limited edition sun prints from a 44 year old litho negative that was made from an image of the taken at the camp. The students came away with a greater appreciation of early photo pioneers like Thomas Wedgewood, photo chemical safety and and ease of use of digital cameras.. One caution, handle with care, use developing trays and make sure hands after washed after rinsing prints in water. Rated 5 out of 5 by almanza from Fantastic Quality! I've used several kinds of cyanotype paper with my art classes. This product is by far the best I've ever used. The images on this website are very accurate...the results are stunning. Easy to use, and instant results make this cyanotype paper the one I will continue to buy for my personal art work and my students projects. Thank you so much. I will be placing another order in a few days. Rated 5 out of 5 by Anonymous from Nice paper I usually use the craft sun print paper so this thick, watercolor paper is really lovely. Nice range of tones. I made some positives from digital negatives with it, and rely on this heavily whenever I am teaching a photography class. All you need is water! Rated 4 out of 5 by Rick from nice heavy stock For most art classes, I prefer to coat paper with students, but we rarely have time to let it dry. This material is consisent in exposure and looks nice when it dries. Rated 4 out of 5 by mka from convenient, consistent used with class project, easy to use. Paper is fully coated, so brushed look is non-existent. Rated 5 out of 5 by goots from Easy to use Works great. Two sided coating makes experimentation easy. Washes off fast! What is the standard exposure time for this paper in strong sunlight please? It really depends how strong the sun is outside. I used around 7 minutes. Try doing tests strips on smaller sheets of the cyanotype paper (do not cut the paper in direct light). Remember, the more time in the sun, the image becomes darker. Too much sun will leave you with just blue paper. No, instructions are not included. I got instructions from my Photography professor. Does Blue Sunprints Cyanotype Paper come in a 13x19 size?